FRISCO, Texas (AP) — Leighton Vander Esch said it almost felt weird to have the ball in his hands again on the first NFL interception for the Dallas Cowboys linebacker. The rookie from Boise State who used to play every down — offense and defense — for his eight-man high school team never said anything about it feeling strange to diagnose a screen pass before it was in the air, slip past a pair of blockers and make a critical open-field tackle for loss. That defensive play of the game in a season-saving win at Philadelphia was a signature moment weeks in the making, through preparation and focus that Vander Esch said should be expected of any team’s first-round draft pick. At least that’s how he sees it. Vander Esch established a Cowboys rookie record with 19 tackles against the Eagles, according to the coaches’ count. He’s the first rookie Dallas linebacker with an interception since injured teammate and mentor Sean Lee had two in the same game eight years ago. Barring a surge from Jaylon Smith, who figures to be his linebacking partner for years to come in Dallas, Vander Esch could become the first rookie to lead the Cowboys (4-5) in tackles since coaches starting tracking the stat in 1977. Vander Esch has 96 through nine games going into Sunday’s trip to Atlanta (4-5), and Smith is second with 82. Smith, a first-round talent relegated to the second round in 2016 because of a knee injury in his final game at Notre Dame, watched as a rookie while recovering from the injury, so his second season was really his first. 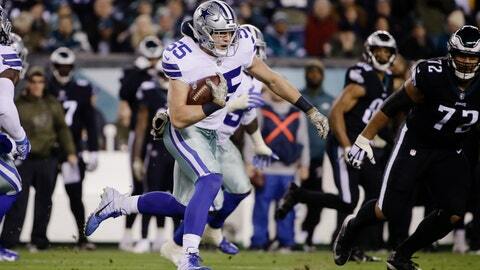 Because of injuries to Anthony Hitchens and Lee, Smith had to play more than expected and struggled at times. More hamstring issues for Lee have forced the 6-foot-4 Vander Esch into essentially a full-time role — he and Smith played all 62 defensive snaps against the Eagles. Vander Esch hasn’t struggled nearly as much, perhaps in part because he’s had Smith out there with him. And he’s had Lee in his ear on the sidelines — and in the meeting rooms all week. The Cowboys have raved about Lee’s preparation for years. Lee has already missed four games with separate hamstring injuries and likely won’t be back until the final month because of the second one. Injuries have defined his career, and several times brought the Dallas defense down with them. Smith’s improvement in his first year without a foot brace that he needed because of nerve damage from the knee injury is part of the reason the Cowboys, ranked seventh in the NFL in total defense, are in their best shape in several years to survive without Lee. The rapid rise of the Vander Esch is the other reason, and perhaps isn’t that surprising considering he went from tiny Riggins, Idaho, to a Boise State walk-on who developed fast enough through a redshirt year and three seasons to enter the draft early. Vander Esch has a signature play to show for it.